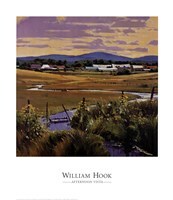 The American Landscape is William Hook's inspiration. Large skies, low horizons, distant mountains, and textured foregrounds are expressed in his paintings with broad brushstrokes vivid color. His work is distinctive and stands out from contemporary landscape painters. Hook's background in art began at an early age. It was through the influence of his father and grandmother, a professional photographer and architect respectively, that art became second nature. Other family members include art historian Bainbridge Bunting, prominent Italian painters Gino and Bertha Venanzi, as well as Pulizer Prize winning author Willa Cather. There was never a lack of opinions and interest when it came to art in the Hook household. After attending classes at the Kansas City Art Institute, William Hook left Kansas City continue his study at the University of New Mexico where he received his Bachelors of Fine Arts Degree in 1970. He went on to complete his formal education at the Universita Per Straniere in Perugia, Italy, and at the Art Center College of Design in Los Angeles. Featured as a one of the notable influences on the western art scene in the book Leading the West by Donald Hagery, magazines such as Southwest Art, Art of the West, U.S. Art, American Artist, and Focus Santa Fe have proclaimed Hook's importance as a leading American landscape painter. His work is included in many distinctive private and corporate collections world wide as well as in the permanent collection of the Denver Art Museum, the Tucson Art Museum, the University of New Mexico, the FORBES Museum in New York City, and the Genesee Museum in New York.